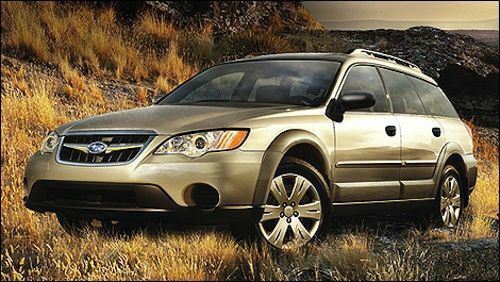 Affected by today’s recall are roughly 200,000 model year 2005 through 2009 Subaru Outback and Legacy vehicles, which may suffer from brake line corrosion and possible fluid leakage. Affected vehicles were manufactured from December 2003 through April 2009, and are currently or formerly registered in Connecticut, Delaware, Illinois, Indiana, Iowa, Maine, Maryland, Massachusetts, Michigan, Minnesota, Missouri, New Hampshire, New Jersey, New York, Ohio, Pennsylvania, Rhode Island, Vermont, West Virginia, Wisconsin and the District of Columbia. According to the National Highway Traffic Safety Administration, salt water may splash on the vehicle’s brake lines through a space in the fuel tank protector, causing excessive corrosion over time. As a result, brake fluid leakage may occur, which may increase the risk of a crash. Subaru will check Outback and Legacy vehicles for leaks and replace any affected brake lines. If brake line leakage is not observed, dealers will apply an anti-corrosion wax. All repairs will be done free of charge. Subaru has not provided a notification schedule. In the meantime, owners may contact Subaru at 1-800-782-2783. Subaru’s recall campaign number is WQG-43. Concerned owners may also call the National Highway Traffic Safety Administration’s Vehicle Safety Hotline at 1-888-327-4236 or visit www.safercar.gov. The automaker first uncovered the problem during internal testing in May 2011. There have been no related injuries or crashes reported, said Subaru spokesman Michael McHale. Tuesday’s recall marks the fourth time Subaru has recalled Outback and Legacy models this year. In January, Subaru recalled nearly 634,000 vehicles because of a lighting issue that may lead to smoke or fire. The recall affected 2009-2012 Subaru Forrester, 2010-2011 Subaru Legacy, 2010-2011 Subaru Outback and 2006-2012 Subaru Tribeca vehicles. The vehicles in question may be equipped with faulty puddle light accessories, which may short circuit when in the presence of a moisture source. As a result, the short circuit may produce heat and cause a fire. Subaru also issued a pair of recalls in March, one of which involved over 50,000 model year 2010-2013 Legacy, Impreza, Outback and XV Crosstek vehicles equipped with remote engine starters that may inadvertently activate. Subaru also recalled 400 Legacy and Outback wagons due to a side curtain airbag defect last month. The airbag issue may result in unexpected airbag deployment in the event of a crash.